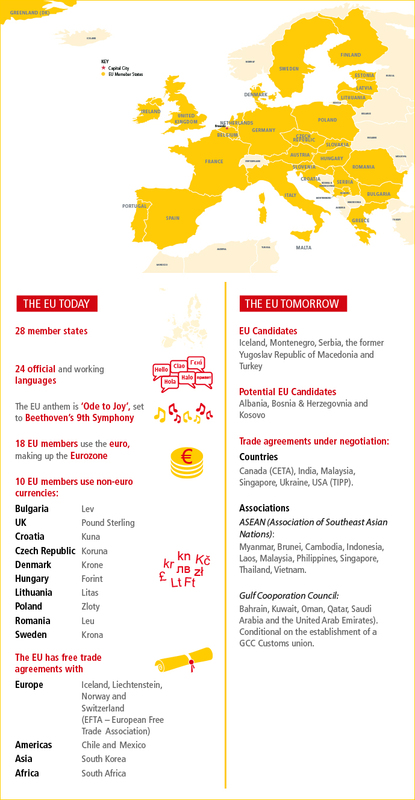 The European Union (EU) is a unique partnership of 28 member states, recognised as one of the world’s largest economies and a key player in global politics. Home to 7 per cent of the world’s population, the EU’s trade with the rest of the world accounts for approximately 20 per cent of global exports and imports. The Union’s internal market provides for the free movement of goods, capital, services and people between members. Through the European Free Trade Association (EFTA), neighbouring non-EU countries have close access to the internal market and a range of bilateral agreements make global trade easier for Union members. Ireland joined the EU in 1973 and the Eurozone in 1999. The Union is an important trade partner for Ireland: 60 per cent of Ireland’s exports go the EU.